120 pages | 3 B/W Illus. The past three decades have seen a global shift in disaster management from an event driven response to a ‘could-be’ risk management approach. Disaster risk reduction (DRR) has become entrenched as a dominant paradigm within the field of disaster management. More than a decade after adopting DRR legislation in South Africa there remains a dearth of evidence that this has translated into substantive action. 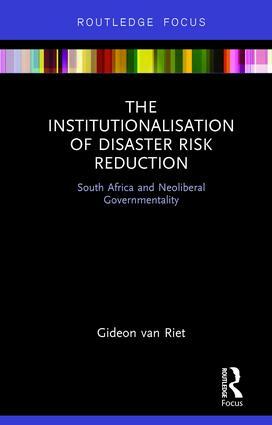 This book examines the institutionalisation of DRR in South Africa, conceived of as a political economy of knowledge production. Using a critical theory approach, the book does not consider why DRR is failing but instead asks ‘why DRR?’ As such, it explores possibilities beyond DRR’s narrow optic and offers new insights into disaster management through the lens of South Africa. This is valuable reading for graduate students and academics working in disaster studies, geography, public policy and development/post-development studies, as well as policy makers. Gideon van Riet is Senior Lecturer in Political Studies at North-West University’s Potchefstroom Campus in South Africa.